You must make reservations at least 5 minutes in advance of the time at Bakersfield - Mass Ave.
chicken, chorizo, black beans, queso fresco, radish, shredded romaine, slaw, buttermilk dressing. This place was great!!! Super friendly and helpful staff! The tacos are phenomenal as is the guacamole. Even their margarita as fresh and delicious!!! We tried to go back again during our 3 day trip, but they were all booked up. We had a great time celebrating a birthday! We had a 5 p.m. reservation for four because our show at the Murat had a 7:30 start. We're glad we did because we were able to get through drinks, appetizer and tacos in plenty of time. Our server, Patrick, did a nice job explaining our options. We tried six or seven types of tacos and all of them were good. The prices were reasonable. I can understand why this is a favorite spot for many folks in Indianapolis. It would have been a perfect 5 star had we got seated closer to our reservation. We waited 35 minutes from when the reservation was made to get seated. The manager did however comp us some appetizers for our wait which was appreciated. Short Rib Queso is to die for! Spicy margaritas & Tacos=NomNom! We were running a little late for an event we were heading to, and the servers made all attempts to accommodate our need for speed. It was much appreciated, and we made our event! The food was rather bland, but the drinks were right on time! We have been to the restaurant before, and it was right where we remembered...pretty good, but nothing out of ordinary is how I would sum it up. Dining in the winter equals a very cold experience. The windows which are great in the summer leak cold air in the winter. With the newer menu they have streamlined the menu items cutting back in the quality of their items. The margarita pitchers were great! We tried 5 of the tacos, (which are on the small side) after the guac & chips. Our favorites were the shrimp and the portobello. Loved the atmosphere...would definitely return! My only issue is that we had a reservation for 630 and we weren't seated til 7. Then we were there til 7:20 before the waiter took our order. Luckily food prep is quick. Food is excellent, different. First time at Bakersfield. It was a great experience from the moment we walked in the door. Definitely will be going back. Great place to eat. I would recommend having a reservation otherwise it may be a very long wait. It was a get together for my birthday. There was 13 of us and our server made the night! She was fantastic. This is my favorite taco place in Indy and I’ll definitely be back as usual. Really good food and service best drinks and tacos I’ve ever had. Only complaint was that it was really loud. I went for lunch with a friend, and it was ok. I suspect it's a lot better at night with a margarita in hand. The tacos were fine, chips and guacamole were pretty good. The service was a bit bizarre. The hostess was great, but our waitress rolled her eyes at us when my friend let her know that we got an extra taco that we hadn't ordered and just generally seemed not too thrilled to be there. I might try it for dinner sometime but won't be back for lunch. Great atmosphere. My table was ready as soon as I walked in. Service was on point, checking on me throughout my meal to make sure everything was ok. The tacos were delicious and if I’m ever back in Indy I will be sure to go to Bakersfield again. Bakersfield is always a great spot to hit on Mass Ave. If you don’t want to wait hours for a table, then I suggest going early. The tacos are amazing, especially the Bistec taco! Their margaritas are good but they’re also very sour and overpriced in my opinion. However, I do recommend trying it out at least once. We enjoyed the food, was just outstanding. Our group was seated on time and our server was lovely. My only issue was that it was extremely noisy and it was difficult to hear the conversation at our table without yelling at each other. Would I go back? YES, the food is worth returning for, but I'd do lunch instead of dinner hoping for a quieter experience. Fun night with family. Beautiful presentation of meal. Fresh and filling. Yum! We will definitely be back! The food is always awesome but the server was pretty bad. He wasn’t attentive at all and tried to rush us out it felt like. Fun vibe!! Took an out of town visitor and loved it! Cozy and cool! Great place to grab a quick dinner before a concert. Fun atmosphere and awesome food. The best fish tacos anywhere! 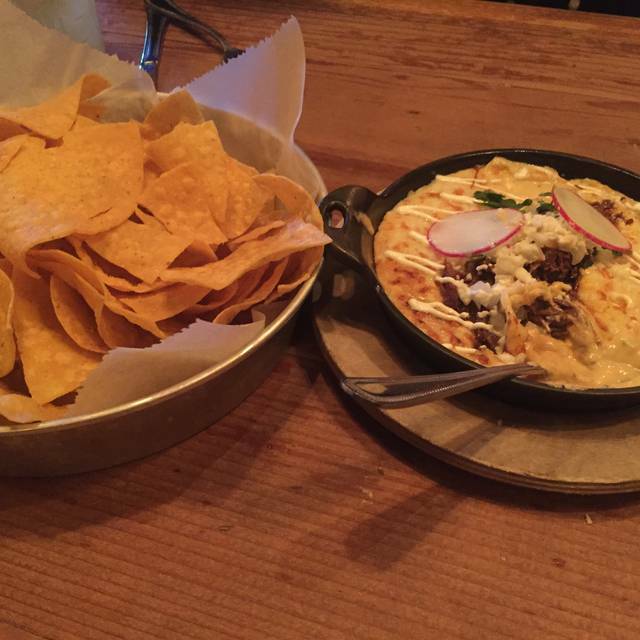 We had the queso with chorizo and an order of chunky guacamole to start off, all of it is fabulous. This is one of our regular spots to bring family visiting from out of town, and the margarita pitchers are the way to go for small groups. Nice that they are now taking reservations as this place can get crowded. 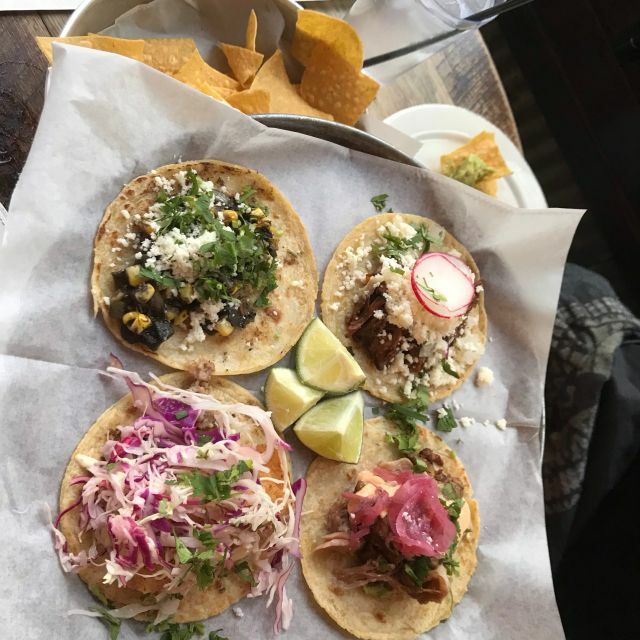 Some of the best tacos in Indianapolis. Took my wife for our anniversary. The staff was so kind and warm. This is one of my favorite places to eat. Even when we had a reservation, we had to wait to get a table. Once on our table, it took around 45 minutes to get our tacos, and when we finally got them, they were cold. Food and drinks are good, but the service today was bad. They were super understaffed - which we weren’t made aware of until we didn’t see our server for over a half an hour. And he let us know our food would be out shortly. Normally service is wonderful there so it was an off night for them for sure. Just something helpful to let your table know ahead of time! The tacos were excellent. We tried both the pork carnitas with pineapple and the steak with slaw. Yummy! We also had the corn side dish that was simply delicious with a little kick. The atmosphere was relaxed and comfortable. And our waiter was excellent. We will definitely go back. The food and service were excellent! We will be back soon. a picnic table of sorts, which was fine, but the surrounding tables were very loud, f-bombs flying from other patrons, so not a great atmosphere. I will say the appetizers we ordered were good (chips, salsa, queso), but the tacos were definitely not our thing. Some of the meat had a very different taste (curry maybe)...anyway we never finished them as we thought they were awful tasting. We were so disappointed, as we had expected so much more. The service was good, no complaints about our waitress. I rarely do reviews and rarely complain about food or a restaurant, but this place really missed the mark. The shrimp tacos are amazing! Waitress was less than desirable. Looked miserable. I was not pleased with my server at this restaurant. She was cute but disconnected. She brought me my bill prior to me being finished which cut my visit short as well as my check. The food was really good as well as different. I thought that the music was a bit loud and unfitting for the theme. I think the place is deserving of an overall good review. Every time I have been to Bakersfield, I have had a great experience. This time was different. The queso was runny, the chips were stale and the tacos were not as good as they have been in the past. Tacos were outstanding, especially the Huicatoche (corn fungus) version. 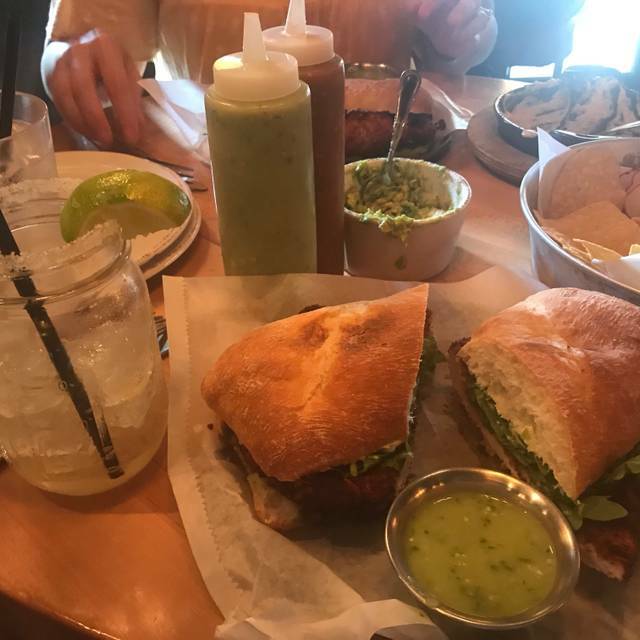 Really enjoyed the torta as well. Went to Bakersfield for a co-worker birthday and we enjoyed ourselves very much! The staff was friendly and very accommodating for our group of 10. Food was excellent and arrived in a timely fashion.